The Mixer widget is an indispensable part of the SoundBridge: DAW interface. It features a main and mini mixer which are essential tools for mixing, routing and taking control of your MIDI & audio channels. 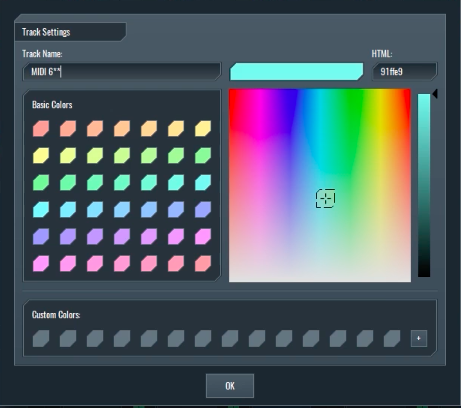 In the next tutorial, we will guide you through all of its functions to help you utilize its full potential. 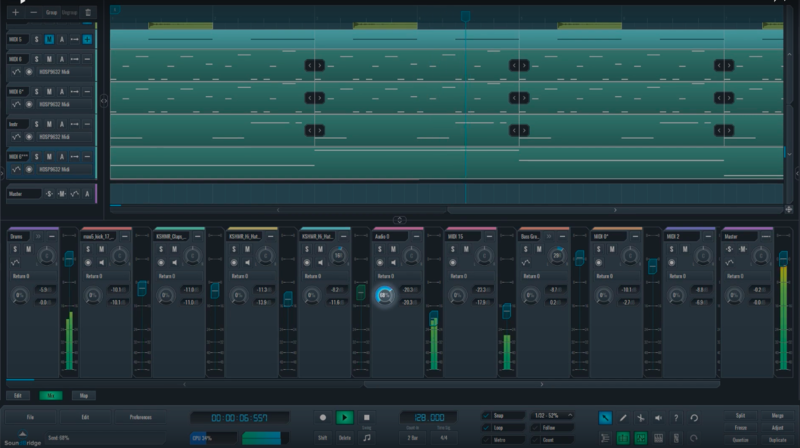 The Soundbridge: DAW offers two options for entering the main mixer widget. Firstly, you can click on the icon we marked in red, which is located on the bottom right corner of the overall interface. Secondly, you can open it by clicking the “Tab” key on your keyboard. The main mixer features some functionalities you will find in the track list and more. The “Gain” and “Balance” controls, coupled with the “Peak meter”, are essential tools for mixing audio. As you can see from the picture below, the “Gain” and “Balance” controls are marked in red. You can see the visual representation of the “Peak meter” value in the gain fader field. It changes color from green, all the way to red if the output of the channel is peaking. By right clicking on the “Channel name” you can enter a new dialogue. Here, it is possible to change the channel name or to color code it. Below the channel name, on MIDI tracks, is the “Input/Output” section in which you can select MIDI input and output devices for MIDI tracks and active audio inputs and outputs for audio tracks. Please note that by clicking on the “MIDI Out” tab within the MIDI channel, the MIDI can be sent out to external or internal target. By clicking one of these tabs, we are introduced to a new dialogue. As you can see from the pictures above, the external targets are all of the external MIDI outputs on your audio or MIDI interface. On the other hand, internal targets are MIDI tracks in your project, or audio tracks that have MIDI enabled VST plugin effect in their insert rack. Again as shown on the pictures above, the audio can be sent to both external and internal targets. External targets are all of the physical outputs on your audio interface. Internal targets are any audio tracks in your project, including the master tracks, to which everything is routed to by default. All “Return” tracks also include the additional “ Pre/Post Mixer” toggle button. Subsequently, it allows you to grab the signal sent to them, either before or after the sources final gain and balancing stages. All channels in the mixer feature a “Collapse/Expand” button. You can find it in the top right corner of every channel. Furthermore, it is used to show or hide all functions, except the name and the gain fader. Consequently, this way you can see more channels at once for a better workflow while mixing your tracks. 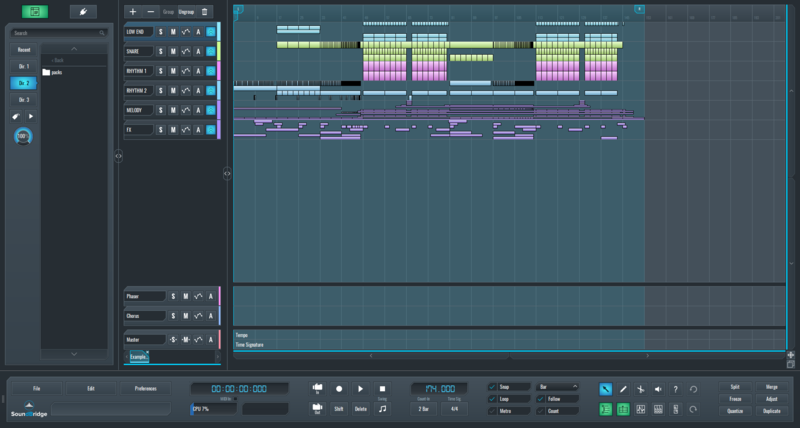 Below the input/output section is the “Send” section for sending the channels to return tracks. Moreover, “Send” is mostly used for parallel effects processing. Right next to the previously mentioned “Gain” and “Balance” controls, we have the “Solo”, “Mute” and the “Arm” functionalities. Additionally, audio channels also contain the “Monitoring” button. The “Arm” button, on MIDI channels, is used for both monitoring and arm recording. As for the audio tracks, the “Arm” button is used only as arm record. The “ Arm” button tells the SoundBridge: DAW, which tracks to record to once the user clicks the “Record” button on the transport bar widget. The “Arm” is what marks the track to record any parameter changes you make on it as automation when recording is engaged. The next two boxes, which can be found on every track channel, are used to monitor the tracks level. The first one is a display field and shows the maximum level reached by the volume of the track. By clicking on pressing it will reset the values meter. The second one shows the current gain faders value which can be also used as an input field where you can type the desired value. The SoundBridge: DAW features a mini mixer as well. You can access it by clicking on the mixing tab on the bottom of the edit window. Use it when you need to look at the sequencer window while simultaneously mixing. It features the same functionalities of the main mixer, with the exclusion of the input and output dialogues. Furthermore, the “Send” functionality is transformed into a rotary dial, which will control the send amount of the return track selected in the dialogue above it.